□ Fig. 7.12. 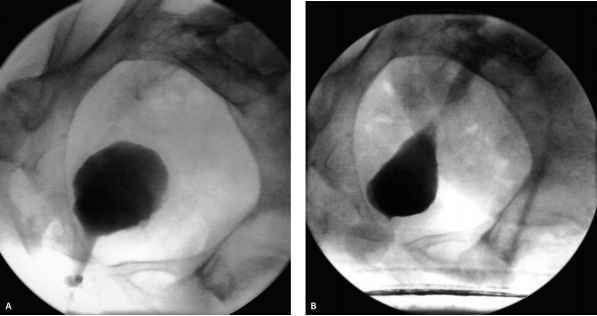 Typical appearance of anterior complete urethral erosion. Here the distal third of the posterior urethra is also eroded bladder is needed for effective closure. Continuing the dissection along both lateral aspects of the bladder neck allows further mobilization of the anterior bladder wall from the back of the pubis. At the 3 and 9o'clock positions lateral to the bladder neck, it is not necessary to dissect into the retropubic space, as there is sufficient tissue here to permit mobilization and closure. Across the posterior aspect of the open urethra, a vaginal incision is made to permit mobilization of a generous inverted U-shaped vaginal flap to provide coverage of the suture lines closing the bladder neck. The flap is based superiorly and enough should be raised so that there is no tension on the suture line when the flap is advanced forward to the tissue margin just under the symphysis where the operation began. The mobile open posterior margin of the urethra is then sutured to the anterior bladder mobilized and pulled down toward the center of the operative field. The bladder neck is closed with a transverse suture line, which is then imbricated with a second suture line. If possible, a Mar-tius flap should be placed over the closed bladder neck. The vaginal flap is then advanced to cover the entire area. Catheter drainage here is a two-edged sword since reflex bladder activity, which in these neurogenic conditions is accentuated by the catheter, tends to pull open the repair. A period of 5-7 days is enough to protect the closure. Catheters are the cause of the problem to begin with and a much better operative field results if all catheters are removed, despite the obvious consequences, 2 weeks or more prior to the operative procedure.